A lot of press releases float across my computer screen on any given day. Senders usually want free publicity for a product, event or service. Most I view as informational. But some contain info worth passing on to readers. There's no future in doing that, if you're wondering. I'd be better off writing poetry. But never mind. The upcoming Fruit Beer Festival is an event that deserves mention here. 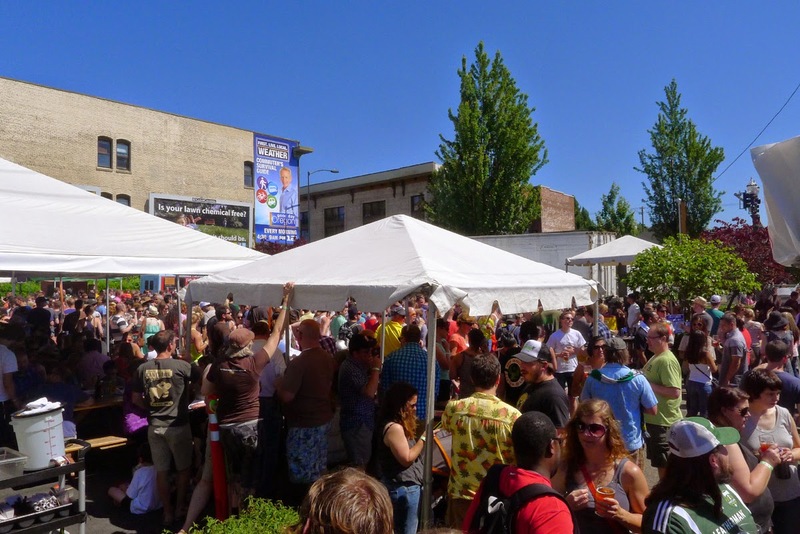 It's happening the weekend of June 6-8 in the parking lot at Burnside Brewing. I have some thoughts on the venue, which I'll get to momentarily. What you need to know, if you don't already, is that this is a pretty good beer event. 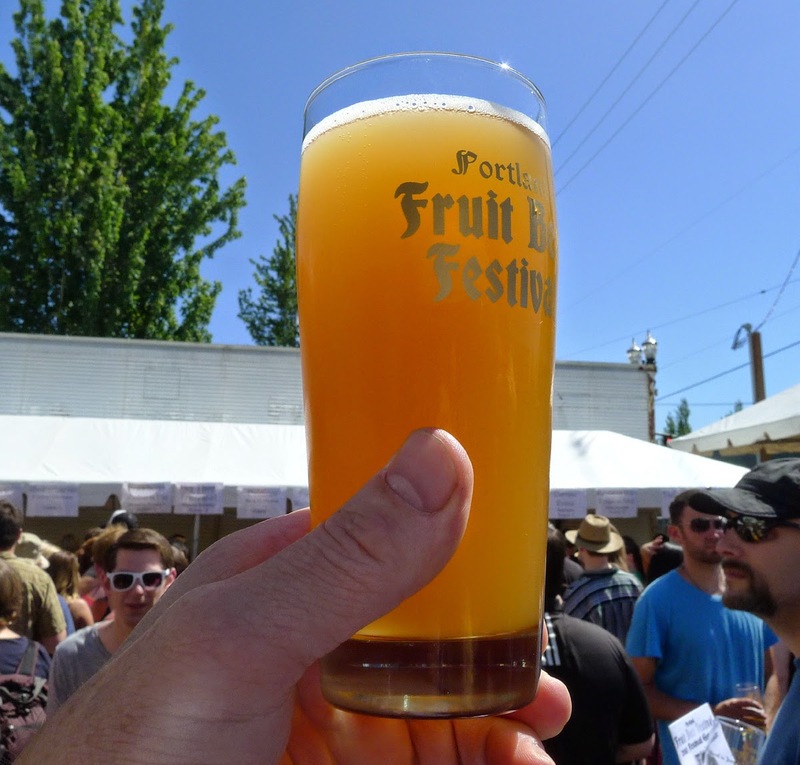 This is the Fourth Annual Portland Fruit Beer Festival. The reason it's become a great event is the taplist is first rate. The 50+ beers and ciders they'll serve up will be similar in quality to what you saw at the recent FredFest, if you were lucky enough to attend that shindig. The PFBF list is here. Keep in mind they will have an additional 25 or so mystery kegs and firkins appearing on rotating taps both days. Good stuff. The festival kicks off with a pre-Fest Pig Roast Dinner at East Burn on Wednesday, June 4. They plan to feature beers from their annual homebrew competition and there will be sneak previews of some festival entries. At $50 a pop, you may want to skip the pig and save your pennies for the actual event. You didn't hear that here. I'm sure it will be a well-attended party. Honestly, the single worse thing about this event is the venue. It's too small. After the second year, the PFBF probably should have moved to a park or comparable site. Or offered drinking sessions. It was so packed on Saturday last year that it was tough to move around. It took 20 minutes or more to get many beers. Of course, the weather was perfect last year. If it goes sideways, the venue may be just fine this year. June festivals are like that in Oregon. One of the things they've done this year, essentially an effort to alleviate overcrowding, is offer a Friday night VIP session. Makes sense. The cost is $30 for a glass and 12 tickets, but Friday night attendance is limited to 300...which means access to the beers, including some special tappings, will be more or less assured. If you're interested in the VIP session, do not delay...tickets are sure to go fast. Early birds, ya know. General Admission and VIP tickets can be had on the event website. General Admission tickets cost $20 for the same glass and ticket count as the VIP version. Be advised a ticket won't get you a taste of every beer on the menu. Some will set you back two tickets or more. Still, the worse thing that can happen is you'll have to contend with lines, particularly if the weather is good. You need to know that tickets, if bought in advance online, will cost you an extra couple of bucks. That logic mystifies me. Event organizers (across the board, not just here) should be encouraging people to purchase tickets in advance to smooth the flow of traffic at entry points. Charging more online than at the door has exactly the opposite effect. Not the brightest. Regardless of its issues, this is one of those events where you just have to look the other way and go for it. The beers are that good. Food will be available and you can even bring along to kiddies, if you wish. There's a lot more info on the website. It's sure to be a good time. Trust me. Your right, having the advanced tickets more expensive than day of tickets doesnt make sense but you say that as if events have any choice. The ticketing services charge their service fees, a percentage of whatever your ticket cost so the higher the ticket cost the more they charge on top of it. To get the advanced tickets cheaper you would have to inflate the regular ticket costs and that doesnt make sense either. Most people still purchase tickets at the door so gouging the majority who could easily turn their backs makes even less sense.